The “Garden in Film” series—conceived by Best Video Film & Cultural Center member and former manager of Marsh Botanical Gardens at Yale Eric Larson—concludes on Sunday, Mar. 10, with a screening of the 2016 movie “This Beautiful Fantastic.” Previous movies in the series were “A Little Chaos” and “Saving Grace” (2000). The screening starts at 3 PM and admission is $7. In “This Beautiful Fantastic,” a young librarian (played by Jessica Brown Findlay), who is trying to write a children’s book, is forced to rehabilitate the garden in back of her flat by the absentee landlord, thus confronting her aversion to plants. among the relevant themes are gardening as source and agent for transformation, the garden as refuge, and garden as connection between very different people. With spring imminent, backyard putterers are turning their thoughts to the garden, which makes “This Beautiful Fantastic,” a charming tale about one, all that much sweeter. Gardens, of course, must be cultivated, and thus they are rich allegorical territory for storytellers of all sorts. Simon Aboud, the writer and director here, works some obvious parallels as he tells the story of a timid young woman, her cranky old neighbor and the garden that separates them, but enjoyable performances keep the tale from becoming too heavy-handed. 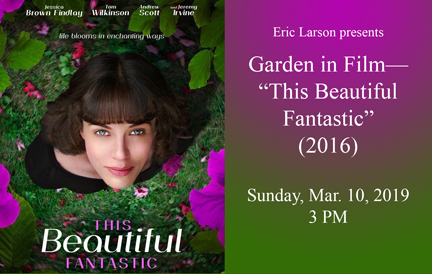 Best Video Film & Cultural Center and master gardener Eric Larson (formerly head of Marsh Botanical Gardens at Yale) presents “Garden In Film,” a series of three garden-themed movies, starting on Sunday, Feb. 10, and continuing on alternate Sundays (Feb. 24 and Mar. 10). The series planted the seed on Sunday, Feb. 10, at 3 PM with 2014’s “A Little Chaos,” starring Kate Winslet. Seedlings break the earth on Sunday, Feb. 24, at 4 PM with “Saving Grace” from 2000, starring Brenda Blethyn. The final harvest occurs on Sunday, Mar. 10, at 3 PM with the screening of “This Beautiful Fantastic” (2016), starring Mia Farkasovska. Admission for each screening is $7. Set in Cornwall, England, “Saving Grace” pits a recently widowed but pugnacious survivor (played by Brenda Blethyn) against the debt collectors and official property appraisers who are circling for payment. She figures out the best path forward is to begin cultivating cannabis for sale. This film touches on the realities of excessive debt, the limits and strengths of friendship and on one woman’s ability to land on her feet in difficult circumstances. Best Video Film & Cultural Center and master gardener Eric Larson (formerly head of Marsh Botanical Gardens at Yale) presents “Garden In Film,” a series of three garden-themed movies, starting on Sunday, Feb. 10, and continuing on alternate Sundays (Feb. 24 and Mar. 10). 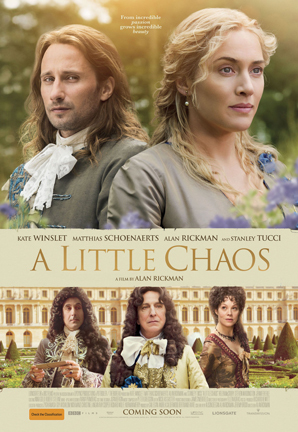 The series plants the seed on Sunday, Feb. 10, at 3 PM with 2014’s “A Little Chaos,” starring Kate Winslet. 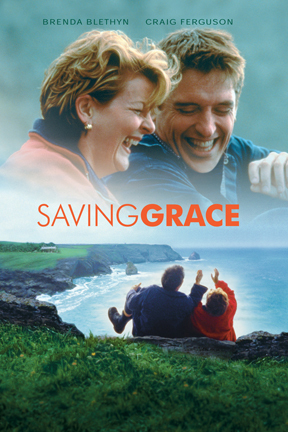 Seedlings break the earth on Sunday, Feb. 24, at 4 PM with “Saving Grace” from 2000, starring Brenda Blethyn. The final harvest occurs on Sunday, Mar. 10, at 3 PM with the screening of “This Beautiful Fantastic” (2016), starring Mia Farkasovska. Admission for each screening is $7. “A Little Chaos,” Alan Rickman’s last film, will be shown on Feb. 10 at 3 PM. This is a fictional account of the design of Versailles with Kate Winslet as a garden designer hired by Andre Le Notre (played by Matthias Schoenaerts) to design one part of this great garden. With Alan Rickman as Louis XIV, this historical drama also features Stanley Tucci as the Sun King’s brother, Duc Philippe D’Orleans. Two varieties of frozen dessert will be served to attendees, with ingredients related to the film. Francesco Casetti, Thomas A. Donnelly Professor of Film Studies at Yale University, will introduce the movie.